Space shuttle Atlantis has just cleared the launch tower in this image, taken May 14, 2010. The successful launch marked the final planned liftoff of the 25-year-old shuttle and the start of the STS-132 mission to the ISS. The final voyage of NASA's space shuttle Atlantis is partof a rare weekend treat for skywatchers on Earth ? a cosmic line up withincredibly bright Venus, the moon, the shuttle ? and even the InternationalSpace Station thrown in for good measure. Atlantislaunched on its final planned mission today at 2:20 p.m. EDT(1820 GMT) from NASA's Kennedy Space Center in Florida to join the spacestation, Venus and the moon in the sky. The shuttle will dock at the spacestation on Sunday, but until then the two spaceships can be easily seen withthe unaided eye (weather permitting) over North America. In addition to this weekend's sighting opportunities,there is one more chance to see Atlantis with your own eyes. That is slated tocome between May 24 and May 26, between Atlantis' departure from the spacestation and its planned landing in Florida. The celestrial sky show will begin tonight at sunset, whenVenus and the moon begin to outshine the twilight from the setting sun. Venuswill appear as a bright object near the moon. The moon is currently a slender crescent, appearing just5 percent illuminated by the sun. By Sunday, docking day for Atlantis and thespace station, the moon will grow fatter to be 10 percent full. Until then, the effects of light reflected off of Earth,called "Earthshine," may be easily seen. Earthshine light can fill inthe darkened portion of a crescent moon, giving it a ghostly look half-lit orbwith a crisp, bright smile. Stunning as they may be, Venus and the moon are just thebackdrop for the orbital chase between Atlantis and the space station as thetwo spacecraft draw closer for Sunday's planned 10:27 a.m. EDT (1427 GMT). ?docking. The International Space Station will be flying over muchof the United States over the next week and where it goes, Atlantis will benearby. The InternationalSpace Station (ISS) is the largest man-made object in thenight sky. It is as wide as a football field and has four giant arrays of solarpanels that reflect light back at Earth, rivaling Venus in intensity. "Some have even caught a glimpse of the ISS in thedaytime just prior to sunset or shortly after sunrise," explains SPACE.comskywatching columnist Joe Rao. "And as a bonus, sunlight glinting directlyoff the solar panels can sometimes make the ISS appear to briefly flare tosuper-brilliance." The shuttle Atlantis is smaller than the space station,but still a bright object in the night sky. It is about 122 feet (37 meters)long and has a wingspan of about 78 feet (nearly 24 meters). Amateur astronomers with telescopes built to trackobjects may even get a better view of the station (and perhaps even a dockedshuttle) when they zoom overhead at 17,500 mph (28,163 kph). Generallyspeaking, Atlantis and the ISS will be visible across parts of southern Canadaand most of the 48 continental United States. Manylocations will be favored with as many as three or four viewing opportunities.In contrast, Hawaii and Alaska will not have any viewing opportunities, norwill there be any views in Canada roughly north of latitude 50 degrees. Over thesouthernmost United States, the viewing opportunities will be reduced to justone or none at all. Somelocalities will be favored with exceptionally good passes. On Friday evening,the ISS will appear to soar to a point virtually overhead as seen from Toronto(9:10 p.m. ET) and New York (9:11 p.m. ET). A similarlyhigh overflight of the ISS will be visible from Chicago on Saturday evening(8:33 p.m. CT), and the two docked spacecraft will pass almost directly overFlagstaff, Arizona on Sunday evening (8:30 p.m. MT). Each willask for your zip code or city, and respond with a list of suggested spottingtimes. Predictions computed a few days ahead of time are usually accuratewithin a few minutes. However, they can change due to the slow decay of thespace station's orbit and periodic reboosts to higher altitudes. Checkfrequently for updates. Anothergreat site is this one, which providesreal-time satellite tracking and shows what part of the Earth the ISS orshuttle happens to be passing over at any given time. NASA is retiring its three-orbiter fleet after nearly 30years of shuttle flight. The move is aimed to make way for new technologies,rockets and spacecraft for more ambitious missions to an asteroid (by 2025) andto Mars in the 2030s. HowBig is the International Space Station? SPACE.com Skywatching Columnist Joe Raocontributed to this report. 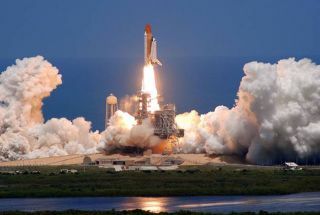 SPACE.com is providing complete coverage ofAtlantis' STS-132 final mission. Click here forshuttle mission updates and a link to NASA TV.